LoraSaysSo! 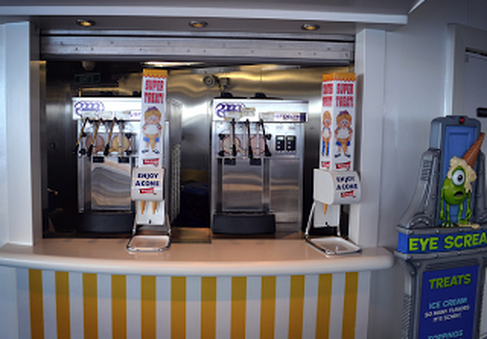 : Seven Secret Foodie Facts on board the Disney Cruise Line! 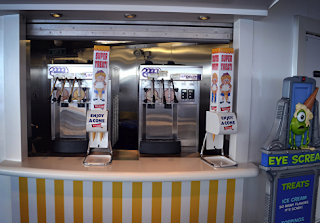 Seven Secret Foodie Facts on board the Disney Cruise Line! I love Disney cruisin' for a variety of reasons but cruising in general is a lot about the all-inclusive FOOD! In preparing for our upcoming Disney Cruise on the Wonder, here are SEVEN secret.... ok, maybe not SECRET, but how about not-so-known Foodie Facts to enhance your cruise experience! 1) Here's some room service info that's on the down low. (Room service is free, but a tip to your server is always welcomed.) 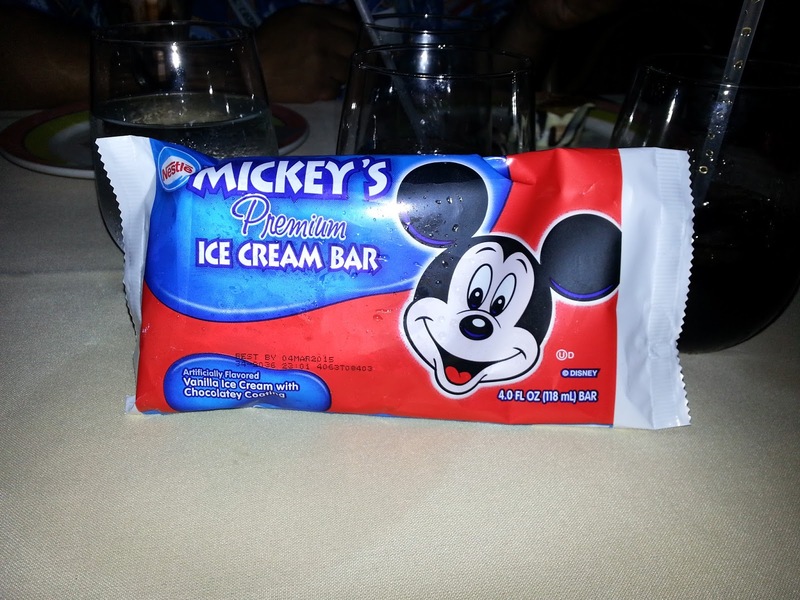 While not on the menu, you can get MICKEY ICE CREAM BARS from room service! 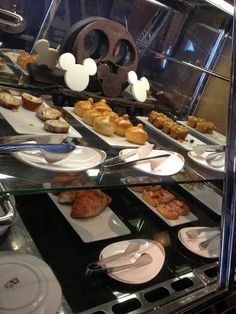 These are must haves on a Disney Cruise!!! And order some milk and cookies before bedtime, but specify you want them warm! That's the Disney touch, request and like magic, it gets done! I saw this picture floating around on the web, and I bet my kids will want to try this! 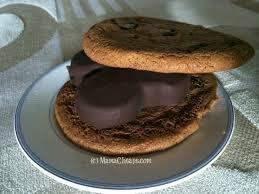 Make your own Mickey Bar Ice Cream Cookie Sandwich! 2) Save money on food when you're exploring a port stop! 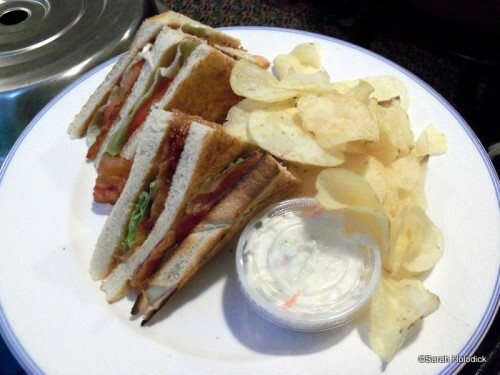 Pack a soft cooler in your luggage, pack some sandwich baggies too, order some sandwiches from room service and take a picnic on the go with you! Give yourself plenty of time for your order to arrive before you need to leave the ship. 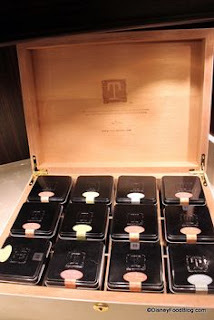 3) Want more of a variety of teas than what's offered at meal time in the restaurants? Go to the spa lounge and select what you like! Grab a bag or two and take with you! 4) Want a pastry to go with your coffee but don't know where to get them? You'll find them at the adult cafes, in a refrigerated case available during the day. Another helpful tip for coffee drinkers who like to start their day with a cup, order a carafe from room service before you go to bed and I heard it stays hot, ready for you when you wake up! 5) Craving some late night eats like buffalo wings or nachos? You'll find a snack buffet at the adult lounges where hor d'oeuvres and appetizers are served late night, 11 pm - 12:00 am. 6) Your kid a milkshake fiend like mine and wants his/her daily dose? Get some milk at the self service station and some soft serve at the ice cream station, mix together with a spoon. Voila! 7) Speaking of kids, did you know you could order off the kids' menu? Yes, not just for 12 years and younger! Its a Disney Cruise, you can order anything you want! Mickey nuggets and fries, two appetizers, two entrees, a sampler of desserts! See our sampler below. Remember the Disney touch, request and magically it is done! Well, these were my Seven Secret Foodie Facts on board the Disney Cruise Line! Hope they were helpful! Last but not least, don't forget to pack some socks and shoes to walk this deliciousness off around the deck and/or visit the gym, membership already included! For more information on the Disney Cruise Line, click here. Have a secret Foodie Fact to share? Please comment below! Great tips. The voice of experience! Love it. I would not of thought of these things but happy to know! I will be ready! Cyn, you HAVE to go on a Disney Cruise! Your hubby and son will love it, I KNOW they will be adding Star Wars stuff pretty soon too! We did the Disney Cruise and now I'll know some awesome foodie secrets for the next trip! Thanks for the idea to take lunch with us when we port - that can save a ton of money! Hi Joann! We went on our first one in 2005, oh my, ten years ago! We've been hooked ever since! WE LOVE DCL!